Under laboratory circumstances with a constant spatial volumetric concentration Cvs, at low line speeds all the particles are in a stationary (fixed) bed at the bottom of the pipe. Above the bed the liquid is flowing through a smaller cross-section Aflow=Apipe-Abed. This gives a higher effective line speed vls,e=vls·Apipe/Aflow. Since the bottom of this cross–section consists of particles, the Darcy-Weisbach friction factor λ has to be determined by taking a weighted average of the friction factor of the bed λb and the friction factor of the pipe wall λw. The method of Miedema & Matousek <?xml:namespace prefix = "w" ns = "urn:schemas-microsoft-com:office:word" />(2014) can be applied to determine the Darcy-Weisbach friction coefficient λb on the bed. 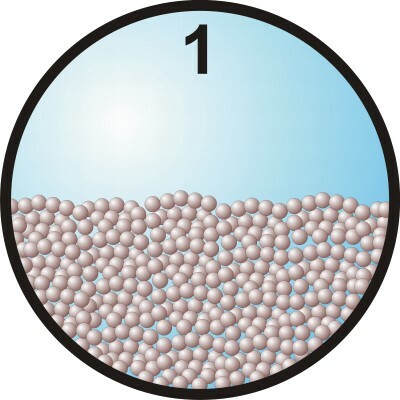 This method does not distinguish between fine and coarse particles. The particle diameter is used for the roughness to determine the Darcy-Weisbach friction coefficient λb. The Shields parameter is below a Shields value of about 1 so no sheet flow occurs. The total pressure loss is thus determined by viscous friction on the bed and the pipe wall.